Following on my previous post (Understanding The SAP CRM Tools ), This post takes a detailed look at the e-selling functionality, which provides information regarding how SAP CRM tools deal with incoming sales orders on the Web. The e-selling functionality can be used to create Web-based storefronts. The Web sites required to transact business in the B2B, Business-to-Market (B2M) and B2C environment are different. The B2B environment involves long-term contractual and pricing arrangements, multiple buyers from a single customer and elaborate shipping requirements. The B2M environment is often characterized by connections with online exchanges and dealing with customers from around the world. Pricing information, inventory availability and product configuration capabilities often are expected by B2M customers. In the B2C environment, the Web site needs to be easy to navigate; electronic catalogs with multimedia content are often required; and shopping carts and credit card payment facilities are an absolute must. The e-selling functionality in the SAP CRM can be used to create these different types of Web storefronts. These Web sites that serve different clientele need many supporting features to be effective. The first and foremost requirement is catalog or content management. The electronic purchasing process depends on the availability of products in the electronic format, referred to as electronic catalogs. The electronic catalogs provide information via text, graphics, pictures, audio and video, among other things. If product descriptions and selling terms and conditions are not electronic, then the buying process cannot be automated. The more detailed and searchable the product database, the easier is the job of the customers. Managing these electronic catalogs is called content or catalog management, in e-commerce jargon. Content management is a complex and costly process. The e-selling authoring tools can be used to create product catalogs. The electronic catalogs can be developed in different formats, such as XML, spreadsheet and Comma Separated Value (CSV); and automatically uploaded to the Web site. The content can be changed, updated or modified. Additionally, these catalogs can also be imported from online exchanges and third-party content providers. The electronic catalogs are of no use unless they can be efficiently searched. The CRM tools also provide a search facility for users. The search tools are similar to the ones you may have encountered on the Internet — for example, Google. The SAP CRM tools can offer self-service functionality for customers. Customers may be able to conduct a variety of activities, such as entering orders, tracking orders, issuing special instructions and viewing their accounts. A new customer can establish an account online and conduct business. Sometimes the software allows the customer to set up a customized screen available every time that customer logs in. These features relieve company departments from routine queries and paperwork while empowering customers to seek information in a timely fashion. The customer can also see a personalized page based on his or her profile, preferences and purchasing history. The customer will see product recommendations, related product categories, and cross-selling and up-selling suggestions that facilitate one-toone marketing. The CRM tools can also be used to create online product configurators. Customers can design products or customize products. Calculators can provide feedback on the prices for designed or customized products; knowledge bases can be used to provide relevant suggestions; and incompatible configurations are flagged and rejected. Such product configurators need to be connected to the back-end systems to ensure accuracy and product availability. The shopping carts, secure connections, and ability to handle credit card and procurement card payments can also be added to the Web site. As the customer orders a product — self-designed, customized or off the shelf —availability and delivery dates need to be calculated. Factors such as current inventory, production capacity, shipping routes, shipping costs and time are considered in making available-to-promise check. The integration may extend all the way up to the supply chain, discussed in the Conversion Cycle. The SAP CRM and SAP SCM tools can be used to provide such integration. Once the order is in place and prices and delivery dates are confirmed, the customer should be capable of tracking orders, viewing invoices and querying appropriate personnel in case of problems. The SAP CRM tools, apart from these features, also provide hyperlinks to carriers’ tracking systems. The e-selling tools can be used to conduct online auctions to get rid of surplus goods and excess inventory. Bids can be solicited, the auction process can be monitored in real time and bids can be evaluated using multiple criteria with in-built algorithms. 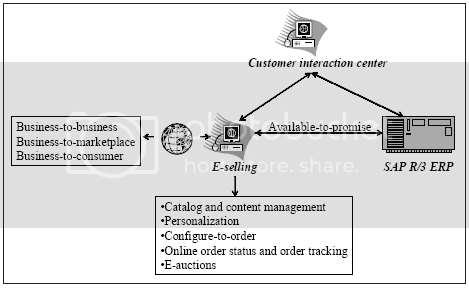 The Web storefront can also be connected with the customer interaction center. The customer can talk with service agents via phone, chat facilities or voice-over-IP options. Customers can also track service requests, connect and explore company knowledge bases, establish online user forums and access online technical support. Routing of customer requests and inquiries is based on automated workflows. These customer interactions and customer activities data are stored in a data warehouse. This data can be used to generate reports concerning customer behavior, retention reports, conversion reports, site metrics and sales analytics. Accounting processes can become part of the CRM process. The customers can establish their own accounts, change contact information and periodically view those accounts. Credit approvals can be automated or performed online. The invoices can be automatically generated and electronically presented to the customers. In the B2B environment, invoices can be altogether dispensed with to support the ERS process. Payments can be made via credit cards or procurement cards and can be executed in the Web store. These developments are discussed in the next sections; however, at this stage please realize that some accounting processes can be handled by CRM software.